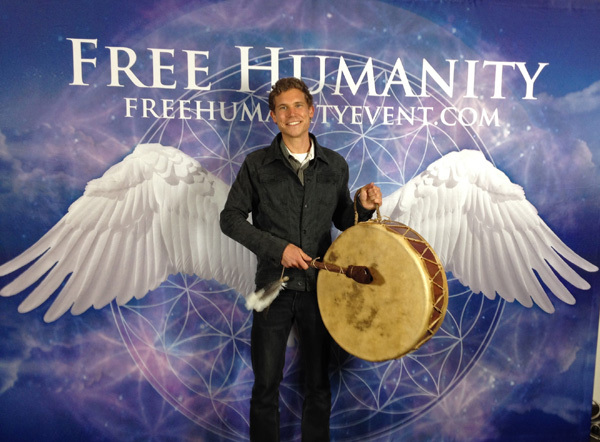 Last weekend in Melbourne I drummed at Jeffrey Slayter’s first ever Free Humanity event. Free Humanity is a mix of personal & spiritual development, education, business training and overall an experience that awakes us all to more of life. As well as attending for my own enjoyment, expansion and investment of my time and energy into such a phenomenal cause, I had planned with Jeff and his crew to bring my drum. I experienced intense ‘anxiety’ before the first time I played. My stomach was sore, cramping and I could feel the sushi I’d had for lunch churning around inside. Half of it was due to nerves. I’d never played in front of such a large group before and there was no set plan – I had to be prepared for anything. Not only did I have to be prepared for any of the strange or weird things that can happen, I wanted to be in a calm and relaxed state so I could tune into the energies of everyone. There was another aspect to the ‘anxiety’ which was not just ‘nervousness’. 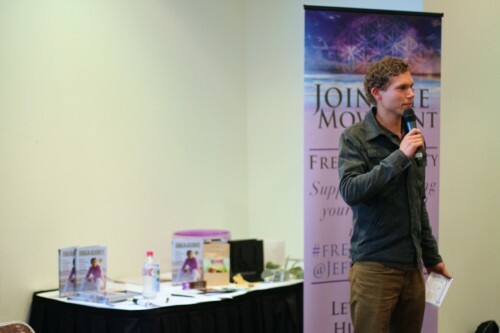 The anxiety was an overwhelm of awareness as I opened up my state to embrace, feel, process and find solutions to the physical, emotional and energetic states and experiences of everyone in the room. My stomach was cramping up more and more and I was squirming in my seat. It wasn’t too bad, but intense enough to take my concentration to sit still, breathe through my feelings and connect to the Earth. This reaction doesn’t always have to be there, but in this case it was – primarily because it was such a step up in terms of volume of people. I’ve only really drummed ‘properly’ a dozen of times and there were over 100 people in the room! Anyway, the time came (thankfully!) and I got into the drumming. To be clear, I was there as a support role as Jeff and the crew have run these experiences many times before. They also play background music/drumming and soundtracks whilst Jeff guides the experience. I can’t say much more about what happens – you’ll have to attend the next one! They are on in major cities around Australia. Click here to see Jeffreys upcoming events. Thanks to Jeff and the team for setting the space and the opportunity to play. I look forward to more incredible experiences in the future. What happens when I drum? Spirit/intuition guides me where and when to drum. As well as drumming for the group as a collective, I focus upon individuals; step briefly onto their path and feel into their body where something is stuck. I provide all the energy/love they require in order for them to enhance their own healing and awakening. In closing the space there are opportunities for peoples’ spirits to return to their body and physically integrate the energetic shifts. My wings are wide open for universal consciousness and gold-white light energy to channel into their bodies so they further embody and reclaim each and every cell. Essentially I give myself to them all in the knowing that they are an expression of me, and this is the greatest thing we can do. The next major event in my calendar is to help hold space and drum at the main Saturday night ceremony at EARTHCORE (A couple of hours from Melbourne which runs from Nov 27 – Dec 1). 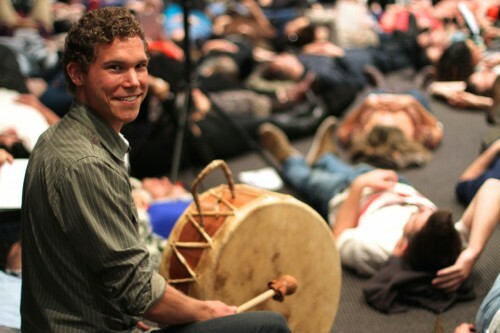 I also will be running drumming meditation/ceremonies in major capital cities around Australia to complement my self-healing workshops. 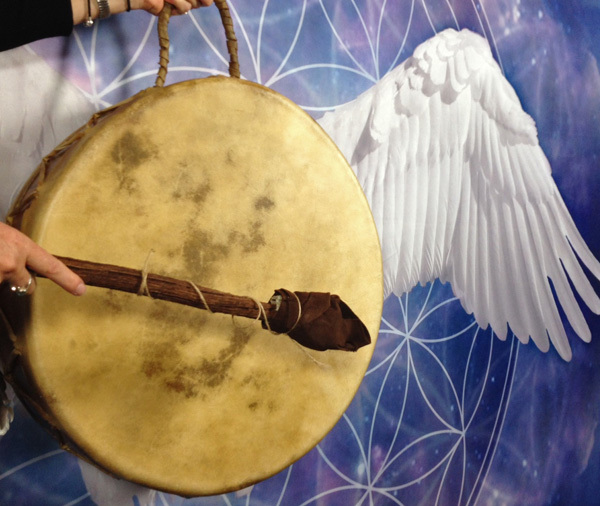 In Melbourne I have been attending semi-regular Full Moon Meditations (picture below) and have been asked to be a space holder and bring the drum in as part of the ceremony and assist everyone present to receive the energetic shifts required for their intention to be created in the physical world. Contact Me to find out about upcoming drumming events. Or perhaps you may have an event in mind at which I could play?